Most people, at least in the media, seemed quick to accept Reid’s apology — and they were right to do so. People have the right to change their beliefs as they and the society around them grow, learn and evolve. That process should be encouraged, not stigmatized. Politics, at its core, should be about persuading people to repudiate misguided and destructive beliefs and adopt ones that are more reasoned, humane and just. And when that happens, it should be celebrated, not scorned. In 2012, the Democratic Party officially changed its position on LGBT equality when Barack Obama “evolved” and announced his support for gay marriage, which he had previously opposed. 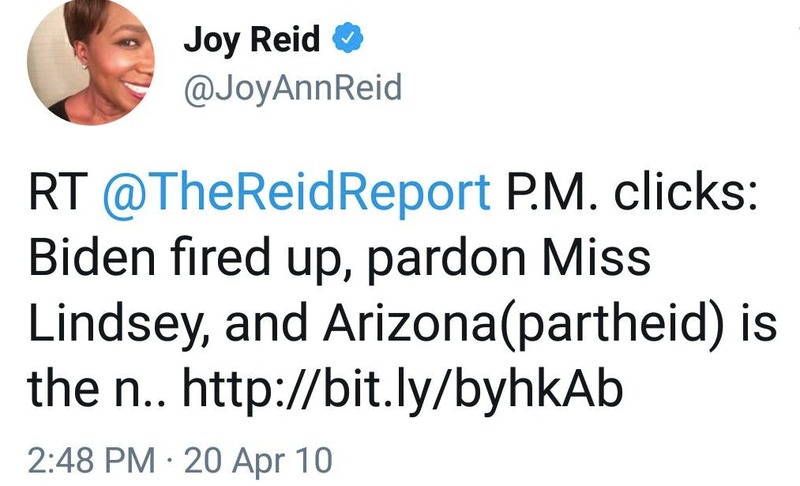 There’s no reason to doubt that Reid (who once worked as a press aide for the Obama campaign) changed her views on LGBTs to align with the new Party dogma. Candidly acknowledging the erroneous nature of one’s previously held views is a virtue, not a character flaw. As someone who has changed many of my own views about a wide range of both political and non-political questions – growth that I hope and expect will continue for as long as I live – I regard it as vital that everyone have the space to re-consider old beliefs and not have them held against one in perpetuity once they are renounced. All humans err, and a critical part of life – one of the parts that makes it most valuable – is learning and changing. The very first line of my first book back in 2006 was this observation from Abraham Lincoln: “I do not think much of a man who is not wiser today than he was yesterday.” That was the framework through which I, and many others, viewed Reid’s December apology. But the last 24 hours have changed the Joy Reid situation considerably. Last week, the same left-wing Twitter user (Jamie Maz) who first unearthed Reid’s anti-gay tweets about Crist unearthed far more toxic, bigoted and vicious anti-gay articles that appeared to be from Reid’s old blog. But unlike the posts for which Reid apologized in December – which she said were intended to mock the hypocrisy of GOP officials who are simultaneously closeted gays but also anti-gay in their politics – these newly discovered articles have nothing to do with GOP hypocrisy. They are just hateful, bigoted and homophobic in their own right. There are many other similarly horrific and bigoted passages that appear under Reid’s byline on her blog – far beyond the ones she previously acknowledged and apologized for. If, in response to these new even-uglier posts, Reid had done what she did in December – acknowledged they were hers, owned her mistakes, apologized for the hurt she caused, and explained that she no longer holds these views – the reaction would have almost certainly been the same. Though many would likely be a bit bothered by just how deeply bigoted these writings were, few would hold them against her now. I know I would have reacted the same: if someone repudiates past beliefs and changes their views, they should be judged by their current viewpoints, not ones they held a decade ago. But, this time, acknowledging and apologizing for these viciously bigoted post isn’t what Reid did. She did the opposite: she denied that she ever wrote them – or, at least, she denied writing some of them. How, then, did they end up on her blog under her name? According to Reid, she was the victim of “hackers”: somehow, nefarious disinformation agents managed to hack not her blog (which is now deleted), but rather the Wayback Machine and its digital archive. They penetrated the Wayback Machine and then, according to Reid, added some anti-gay content. Is it technically possible that hackers altered the digital archives of the Wayback Machine? Probably. After all, pretty much anything is possible. Regarding the Wayback Machine, I don’t know. I’ve never heard of that happening but it doesn’t mean that it couldn’t happen, I guess. Was it the very last post that she published? Because if it wasn’t (and depending upon how her blog was set up), then there may have been more than one copy that would need to be hacked. My old Blogspot blog is like that..That’s an awful lot of work for a hacker to do, and for what end? To make a homophobic person appear MORE homophobic? Moreover, some of Reid’s uglier, confirmed writings – not just about gay people but also trans people – square quite consistently with the newly discovered writing that she denies. Indeed, Reid has a far more extensive – and far more recent – record of homophobic and transphobic writing that is independent of the material she wrote about Charlie Crist, that post-dates it, and is material for which she never apologized. Reid, for instance, was a vocal defender of the abuse doled out by the U.S. Government to Chelsea Manning, which the U.N. concluded was “cruel, inhuman” and bordering on torture; she mocked that abuse as nothing more than Manning whining that she wanted a “pillow.” Reid repeatedly suggested that Manning leaked not out of conscience or horror at what the U.S. military was doing in Iraq but due to mental problems from being trans. None of this precludes her hacking claims from being true – maybe “external” actors decided to augment her confirmed bigoted, anti-gay writing with even more bigoted, anti-gay writing – but it is certainly probative on the question, given how consistent the passages she denies writing are with the ones she clearly did write. Regardless of one’s views on Reid’s past anti-gay remarks, and regardless of what actually happened here, this is a serious news story: obviously so. And the biggest part of the story is not whether Reid wrote this anti-gay content: again, if she did, and she acknowledged and apologized for it, that should not be held against her. The biggest part of the story is the veracity of her remarkable claim – that she’s making not ten years ago but now – that it was hackers who wrote the offensive material under her name. Only one of two things can be true here, and they are both rather consequential: either (a) hackers found a way to effectively alter the digital archives of the Wayback Machine in order to smear the name of a major TV news personality by attributing fabricated content to her, or (b) this major TV news personality is lying – not ten years ago, but today – in order to falsely deny authorship of her own journalism. Given the important issues at stake that liberal media outlets have vocally elevated as crucial – LGBT equality, combating bigotry, the security and reliability of online information, the dangers posed by hacking, journalistic integrity – one would think that they would be quite interested in this story and the critical questions it raises. But one would be quite wrong in assuming this. So four months ago, Reid took ownership of the mocking remarks found on her old blog, even adding “there’s no excusing it.” Now she’s saying it wasn’t her at all and the FBI has been notified. Why didn’t she realize the problem before she apologized last year? Why didn’t she mention that she believed the site had been hacked until this new, unflattering material was revealed? Mediaite notes that the person who sent them the fresh examples also sent them links to the internet archive showing where the screengrabs came from. However, the entire site is now gone from the archive so it’s no longer possible to see the archives of The Reid Report. One way an archive can be removed is by the owner of the site adding a robots.txt file which tells the Internet Archive to exclude the site. Another way is to email the site and ask them to remove it. 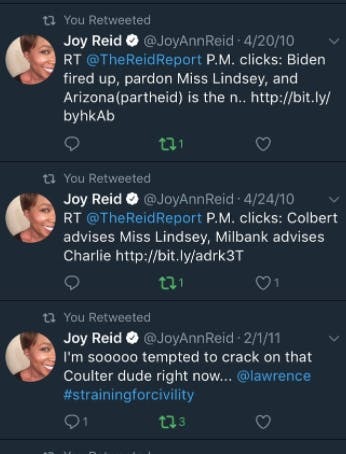 So it seems that, sometime after the story broke last December, Joy Reid had the archive taken down. Did she do that because she knew it had been hacked or because it was embarrassing? It seems she was embarrassed by it last year but now it’s someone else’s fault entirely. A CNN reporter, Nathan McDermott, expressed subtle yet obvious skepticism: “Joy Reid uses the old, ‘I was hacked!’ defense after newly discovered homophobic posts from her blog were revealed.” (by “old,” perhaps McDermott was referencing the fact that Anthony Weiner, along with many others, originally claimed his accounts had ben “hacked” when embarrassing material was revealed under his name). By very stark and notable contrast, liberal news outlets and liberal journalists have steadfastly ignored the story almost completely (the only exception I’ve seen is a tweet from the editor of one large liberal blog who suggested that Putin was behind the hacking in order to ruin Reid’s reputation). Just as right-wing sites would be steadfastly ignoring this story if a Fox News host – in response to embarrassing articles found on their website – had claimed they were the work of bizarrely innovative and enterprising hackers, while liberal sites would be flooding the internet with detailed and indignant coverage of those claims, liberal sites are going to just pretend the Joy Reid story does not exist until it disappears. Reid knows this – she works every day with the people who run these liberal outlets and she knows exactly what their mentality is – and that’s why she feels no obligation even to address it beyond the statement she provided to Mediaite. Reid is assuming that liberal media outlets will prioritize their ideological and partisan affinity for her over their proclaimed, profound concern for LGBT bigotry, hacking and journalistic integrity. And on that question, at least, Reid is almost certainly right. Perhaps this is one of the reasons why trust in media institutions has collapsed to the point where people are as willing to believe what they read from fake sites as they are from established ones?